Red Rajasri is the Ordinary Portland Cement Type 1. Its specification conforms to the Thai Industrial Standard for Mixed Cement TIS 15 Books 1-2545 TYPE 1 which is equivalent to the standard ASTM C 150-07 TYPE I of the United States. Green Rajasri Brand cement is mixed cement produced to meet the requirements of Thai Industrial Standard TIS 80-2550. Super Rajasri Brand cement is mixed cement produced to meet the requirements of Thai Industrial Standard TIS 80-2550.
around 1,500 C. The materials will react and transform to a chemical compound called clinker. After that, the clinker will be rapidly cooled and passed to a cement mill at the grinding process. before packaging the finished cement or storing the cement powder in silo for further distribution. maintained cement in silo can last for months. 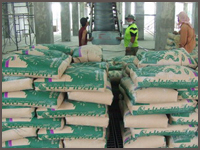 For cement supplied in bags, temperature and humidity is controlled properly in the storage area. We consistently audit and record to ensure quality of our cement products. it off immediately with clean water.